We have come up with a new name for the worst Head Scratchers – “Violent Offenders.” These are the names that are bad beyond belief. 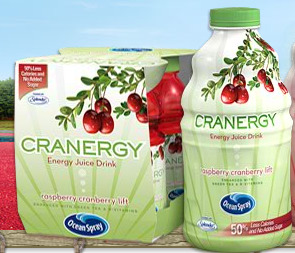 The first contender is the new drink from Ocean Spray called CRANERGY, the forced combination of CRANBERRY and ENERGY. What old-school naming firm got Ocean Spray to drink the Kool-aid and actually believe that this trainwreck of a name is good? Too bad Ocean Spray didn’t run this name through the Eat My Words SMILE & SCRATCH Test and save themselves the misery of a bad name and expense of pouring millions of dollars into advertising so consumers will actually remember the name.